The Arches in Longdyke, near Morpeth, Northumberland sleeps 5 people. 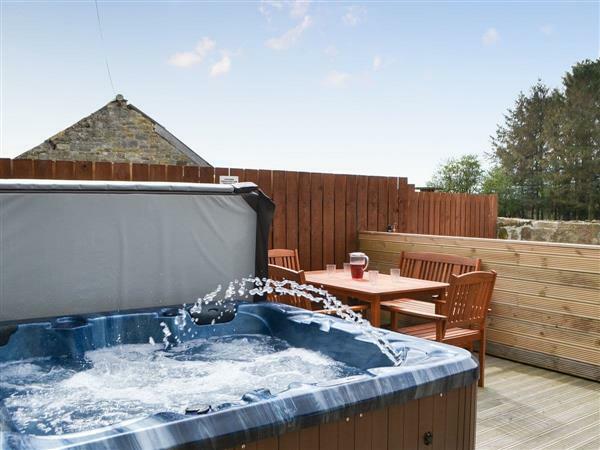 The Arches near Morpeth has a private hot tub for relaxing; this converted barn is ideal for small families or friends. The Arches is set on a quiet road on the edge of the owner’s farm near Burgham Park Golf Course, just off the A1. Relax by the wood burner on cooler evenings or in the hot tub, which is set on the outdoor decked area, after a days exploring. Just ½ a mile from the acclaimed golf course at Burgham Park, The Arches is ideally located for exploring all of this friendly and unspoilt county. The lovely village of Felton has an award-winning pub and tea room with a friendly village shop. The pretty historic town of Morpeth is only 9 miles with riverside boats, great mix of shops, pubs, eateries, swimming pool and parks. Being close to the A1 provides excellent access to Alnwick and all the major tourist spots. The railway station at Morpeth is ideal for leaving your car and hopping on a train to Edinburgh, Newcastle or York making day trips hassle free. Alnwick only 12 miles away and houses the large treehouse restaurant situated in the Alnwick Gardens, and the castle is a great attraction where scenes from Downton Abbey and Harry Potter were filmed. The Northumberland Country Zoo at Eshottheugh Farm is nearby and a short drive takes you to Druridge Bay Nature Reserve with glorious sand dunes at the start of the Heritage Coast. Ideally located to travel inland to Rothbury only 11 miles away, over to Hadrian’s Wall to Housesteads Roman Fort and museum, 39 miles away, and the vibrant city of Newcastle is only 24 miles. The beach is 10½ miles from The Arches near Morpeth. With the shop and pub 2½ miles, and the restaurant is ½ mile from The Arches. Living area: With wood burner, 40’’ Freeview TV, DVD player, single sofa bed and wooden floor. Kitchen/dining area: With breakfast bar, electric cooker, fridge/freezer, washing machine and wooden floor. Bedroom 1: With double bed, 24’’ Freeview TV and en-suite with shower cubicle and toilet. Bedroom 2: With double bed, 24’’ Freeview TV and en-suite with shower cubicle and toilet. Solid fuel heating, water heated by solar panels, electricity, bed linen, towels, Wi-Fi and fuel for wood burner included. Cot or cot bed (for children up to 4 years old) available on request. Decking to front with garden furniture. Hot tub for 6 (private). Private parking for 3 cars. No smoking. Holidays at The Arches run from Friday to Friday. Pets allowed at The Arches. For a better idea of where The Arches is, you can see The Arches on the map below. The Arches is in Northumberland; should you be on the lookout for a special offer, you can find all the special offers in Northumberland. It's always worth checking to see what is on offer at the moment. Do you want to holiday near The Arches (UK3223), you can see other cottages within 25 miles of The Arches; have a look to find your perfect holiday location.